You are here: Home / Featured / Braley And The Argonauts :: Have Your Say! Braley And The Argonauts :: Have Your Say! Well it’s official. 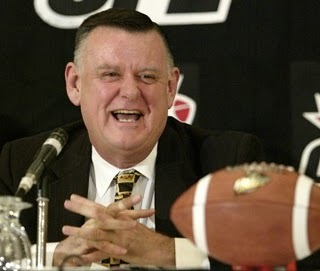 The BC Lions and the Toronto Argonauts are now owned by David Braley. In a statement issued by the league, commissioner Mark Cohon tries to ease concerns about an owner owning two CFL franchises. “Even now, when Canada is slowly emerging from a deep recession, and the vast majority of businesses and entrepreneurs are solidifying their holdings as opposed to pursuing new ventures, we sought and received strong expressions of interest in the Argonauts from a number of other sources,” Cohon said. “But in the end, this was the best option for the future of the Argonauts and the health of the Canadian Football League. As stewards of our league, and all the CFL has come to mean to so many Canadians, our Board of Governors took into account three important factors,” he said. “The first was the quality of ownership in our league. We are unanimous in the belief we would much rather have an exemplary person with considerable financial resources and an undeniable love for our league sit atop two franchises than have any one of our franchises owned by someone of uncertain means or questionable character, or someone lacking in a real, long term commitment to what’s best for the CFL and its fans,” Cohon said. “The second factor was the integrity of our game. We understand there are those who will now view every interaction between the Lions and the Argos with extreme scrutiny. I can assure them their vigilance will be nothing compared to the way I and my colleagues in the league office will monitor every transaction and every game involving these two teams, reserving every step of the way our right to veto any trade or punish any initiative that fails to clearly meet the highest standards of competitiveness,” he said. As a fan of the BC Lions, I am hoping everything the commissioner says is true. I am a huge David Braley fan, and yes I think he’ll do everything above board and make sure there are no conflicts. But what happens if a Lion is a free agent and ends up in Toronto, or vice-versa? What happens if Wally Buono isn’t extended in BC, then magically appears in the Hog Town? There will be a lot of question thrown out there if those situations start to occur. Frankly I don’t think the league needs any of that scrutiny either. Perception can be very damaging from a marketing standpoint. David Braley saved the BC Lions, and I hope he has success in doing the same in Toronto, but as a fan I want an owner who is 100% committed to the BC Lions. It’s for that reason, I now hope that local ownership can be found for the Lions. The team is prosperous, and in two years will have a fancy new retractable roof to market. They are competitive each year, and have stable football people in place. These are all attractive features for a potential buyer. Congratulations to Mr. Braley, and to the fans of the Argos, you’ve got a good man in charge. But like the commissioner, Lions fans will be watching every move from here on out with keen interest. What is your opinion on David Braley owning two CFL teams? We’d like to hear from you, so leave a comment below.